This stunning book charts the rich history of the blues, through the dazzling array of posters, album covers, and advertisements that have shaped its identity over the past hundred years. The blues have been one of the most ubiquitous but diverse elements of American popular music at large, and the visual art associated with this unique sound has been just as varied and dynamic. 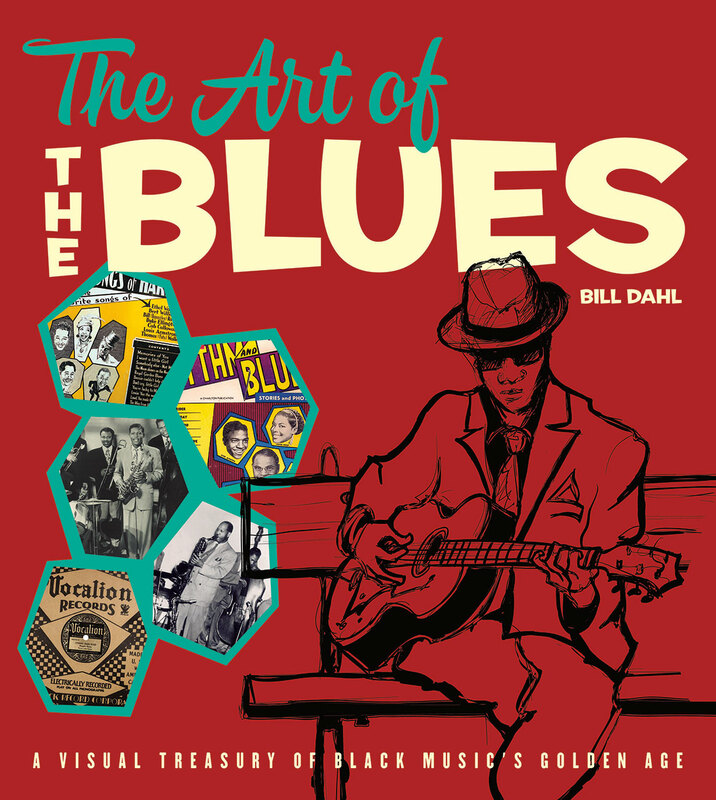 There is no better guide to this fascinating graphical world than Bill Dahl—a longtime music journalist and historian who has written liner notes for countless reissues of classic blues, soul, R&B, and rock albums. With his deep knowledge and incisive commentary—complementing more than three hundred and fifty lavishly reproduced images—the history of the blues comes musically and visually to life. What will astonish readers who thumb through these pages is the amazing range of ways that the blues have been represented—whether via album covers, posters, flyers, 78 rpm labels, advertising, or other promotional materials. We see the blues as it was first visually captured in the highly colorful sheet music covers of the early twentieth century. We see striking and hard-to-find label designs from labels big (Columbia) and small (Rhumboogie). We see William Alexander’s humorous artwork on postwar Miltone Records; the cherished ephemera of concert and movie posters; and Chess Records’ iconic early albums designed by Don Bronstein, which would set a new standard for modern album cover design. What these images collectively portray is the evolution of a distinctively American art form. And they do so in the richest way imaginable. The result is a sumptuous book, a visual treasury as alive in spirit as the music it so vibrantly captures. "The Art of the Blues celebrates the visual swagger of the blues simply for the sheer joy of those visuals. This exhaustive book, resplendent in a handsome crimson cover that’s littered with a collage of artwork from the world of blues, is a rich tapestry of how art was used to push the blues as an undisputed king of music in its 20th century heyday. The Art of the Blues is a seemingly endless in its handsomeness and would be most welcome as not only a perfect accompaniment to your favourite blues LPs, but also as a sublime pictorial history of the blues itself." "The Art of the Blues will be a jewel in any blues fans library. It not only enhances the ability to understand and enjoy the music, it acts as a lavish historical document that will enrich anyone’s understanding of American history and the blues place in our ever changing society.One may be tempted to buy multiple copies so the lavish images can be mounted individually for display; they’re that high quality, and there are so many of them! The depth and quality of the images is almost overwhelming, providing the opportunity for discovery whether it’s the initial or hundredth time the book is enjoyed." "This is a real visual masterpiece, recommended if you have a suitable coffee table to place it on to impress your mates when they drop round of an evening." "[The Art of the Blues] is a stunner. The text is deeply researched and fluently written by Bill Dahl a freelance music journalist, a prolific liner note writer and author of Motown: The Golden Years. Invaluable knowledge and advice was provided by Chris James, an award-winning recording artist and music historian. . . .The visual presentations of the music similarly passed through different phases which makes this landmark book a valuable historical reference work and educational tool as well as being a stimulating and joyful book to browse." View Recent Awards page for more award winning books. You may purchase this title at these fine bookstores. Outside the USA, see our international sales information.